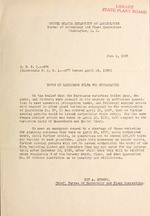 "Supersedes P.Q.C.A.--277 issued April 22, 1930." varieties Glory of Sassenheim and Sprinrf 1lory. No. 37 without limitation as to quantity wid utilization.